Last week, I attended the Ford Trend Conference where my take away buzz words for the future of the automobile industry were mobility and accessibility. During the conference, I attended several panels which focused on the future trends of design, eco-psychology, technology, and the impact of urbanization. Truth be told, although the panel discussions were fascinating, the second day of the conference was a blast! Mama got to drive several Ford cars on a make shift track. I felt like a kid in a candy store. See my part II about my Ford driving fun. (I even have footage of my fearless navigation of the twists and turns of the track. Yeah, baby.) But this article is all about the trends because trends change the world. Why are future trends so important? At the January Ford conference, the Company discussed how long it takes to bring a car to the market. Therefore, they have to take into account what the public will want and need in the future. Not an easy task since our world seems to be moving faster and faster due to technology. When you think about future predictions, it is one risky venture. The product design can either break or make a product. Either we love it or hate it. 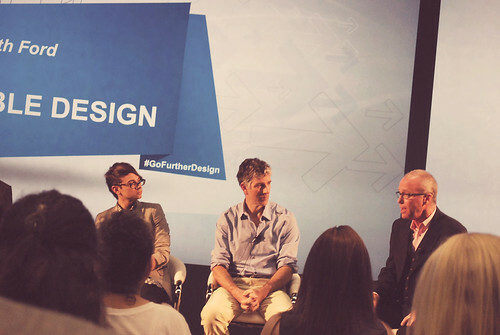 Panelists Adam Kalkin (architect who re-purposes shipping containers,) Gretchen Gsccheidle (Herman Miller,) Christian Siriano (Project Runway winner and young fashion designer,) and J Mays of Ford discussed how technology has changed design. Never before have companies been able to see the trends of what moves people as quickly as they can today. In fact, Ford’s cars are 85% recyclable and made of many green design elements. (See picture above.) And what’s really exciting is that their choice to incorporate green design did not negatively impact the overall design quality of the car. In fact, Ford has made a commitment to offer luxury amenities throughout its fleet of cars to reach a wider set of consumers. Ford uses its 3-D virtual technology to enhance the consumer experience which in turn increases production and reduces cost. I was able to experience how they evaluate interior quietness and virtual driving experience. Utterly fascinating. Ford needs an “e” at the end of its name. Their sustainability commitment was mentioned numerous times throughout the conference. During the keynote address, Chairman of the Board, Bill Ford, spoke about his thirty year struggle to change the course of Ford. He joked that he could have been fired because of his environmental vision. Luckily, he had the right last name. But, despite the challenges, he never gave up. When I asked him what advice he would give other environmental champions, he urged others to not give up which is a testament to the change in Ford. But how do old patterns shift? Panelest Adrian Grenier (Entourage) Peter Glatzer (co-founder of SHFT,) Liz Heller (works with TOMS) Ford’s Director of Sustainability, and Tim Sexton (E2Sexton) talked about the butterfly effect. Small changes have rippling effects in our world. Ford’s commitment to sourcing recycled materials for their cars, increase fuel efficiency and reduce energy and water usage are ways that Ford is spreading its butterfly wings. Interestingly, I asked the panel how we can motivate more people to make green shifts. Adrian thought people are fearful of change. 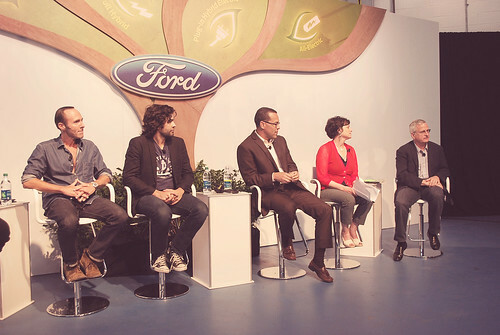 After the panel discussion, the Ford sustainability panelist approached me and told me that people want fuel efficient cars. The company greens its cars as a mainstream concept in its efforts to creat fuel efficient cars. Kind of like give them what they want, but also give them what they need. Ford is working with over 2500 developers that includes Nuanance, Pandora, Microsoft, and Sony Audio to increase the connectivity in their cars. Voice command, hands free parallel parking, driver assist, and heart rate testing. It is all at your fingertips. Or should I say at your voice? For more information about Ford’s connectivity feature see here. There were two different panels about how urbanization is changing the landscape of mobility. One panel featured Tom Artushin, Ford, Gretchen, Effgen, Zipcar and Amy Marentic, Ford. They discussed how car sharing services like Zipcar and driver assist technologies reduce drivers anxiety and congestion. Shockingly, one panelist stated that the younger drivers are delaying obtaining driver’s licences because mobility to them is a smart phone. Why go to the movies when you can download movies to your phones or computers? Carol Coletta, an urbanization expert (ArtPlace) talked about the changes in cities. (She is in the middle.) In fact, living in the city is considered “cool” now among the younger generation. Personally, I also think baby boomers will be returning to the cities as empty nesters. Living in the city changes the automotive dynamics and increases congestion. Who needs a car when you live in a city especially with services like Zipcar where you can “rent” a car by the hour. Ford has reacted to this trend by partnering with Zipcar to provide cars for college campuses. In addition, their Ford Focus is small and electric for those short trips. As you can see future trends shape companies’s product lines. In Ford’s case, they have responded to increased accessibility and mobility through their design and technology offerings. What trends are you seeing in your work that is shaping your product lines? What decisions are you making when purchasing products for future use? What lifestyle choices have you made or will be making based upon the future? Disclaimer: Ford paid for my trip and accommodations while visiting the conference. All the opinions are mine.